Siboya Bungalows was formed by Mr Chung when he left the increasingly developed Railay Beach due to increased rent. There he had built up a dedicated following of foreign holiday makers, and many of them threw in some cash to build their own beach houses at the new spot on Si Boya. 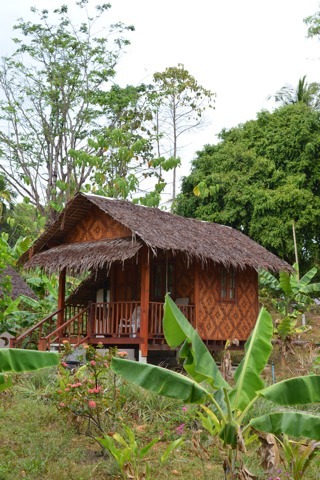 A handful of always rentable bamboo bungalows have been added to the dozen or so houses that come in various sizes and can be rented out when the owners aren’t around. The regular thatch-roofed stilted bungalows are surprisingly inviting for the price. They each come with hardwood floors, firm but comfortable bed with fresh sheets and high-quality mosquito netting, a few windows, moveable fan, large front porch with tables and chairs and clean cold-water bathroom with Western flush toilet. These are set back from the beach on the other side of a moat with no shortage of monitor lizards (they keep the pests in check we’re told). Mosquitoes can be a problem at night, so bring repellent. The lovely wooden beach houses are set in a more private area that spans a good distance south; you can select from a simple yet romantic cottage with king-size bed, up to a three-bedroom, two-floor home. Each house goes for a different price, so it’s best to check out the website and reserve the one you want in advance. The resort’s friendly and relaxed staff serve great food in a spacious restaurant, and you’ll also find free WiFi, several kayaks and hammocks, salas and volleyball nets are dotted around the well-kept grounds. Discounts are available for stays of more than a few days. Siboya Bungalows has a small office on Chao Fah Road in Krabi town (near K Guesthouse), which makes it a breeze to get here.